A man got more than he bargained for when he left his GoPro lying on the ground - after a quick-witted squirrel stole it in a Canadian park. In the footage, the rodent climbs down the tree and peers inquisitively into the lens before grabbing it and scampering back up the trunk. Making off with the camera , the animal manages to film itself on the run, taking the viewer on a amazing point-of-view journey through the trees at high speed. It gives a fascinating insight into tree-top, critter life. Despite the fact that it has almost certainly never used a camera before, the footage is incredibly clear, with regular pauses to observe the view. Incredibly, the man seems determined not to lose his piece of equipment and pursues the squirrel by foot and then up into the tree. The man appears breathless at the end of the clip as he announces to the camera, "Well, I got it back!". 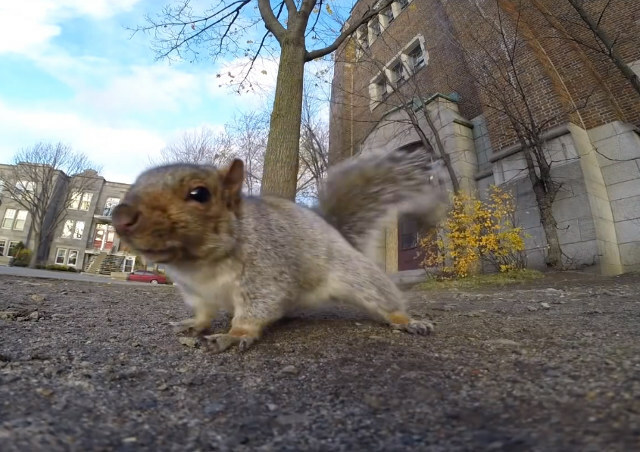 Responses to "Squirrel Steals GoPro, Shoots Amazingly Good Video Running Through A Tree "